A wonderful romance. Eben Adams (Joseph Cotton) is a struggling artist in New York. 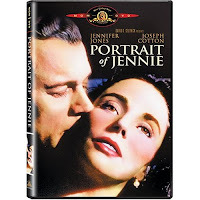 As he is walking through Central Park one day he meets a young girl named Jennie Appleton (Jennifer Jones). They begin to talk and it becomes clear that Jennie has a school girl crush on Eben. She asks him to wait for her until she is older. She disappears a quickly as she arrived but Eben is haunted by this beautiful young girl. Eben sees Jennie several more times and each she she arrives she has aged significantly. This is when Eben realizes that something is not quite right when it comes to Jennie. Eventually she becomes an adult and they begin to fall in love. However, when Eben does some research he learns that she has been dead for several years. Now Eben must try to change the course of history to keep his love with him in the present. I really enjoyed this movie. It reminded me of Somewhere in Time with Christopher Reeve and Jane Seymour. Cotton and Jones were wonderful as the two lovers who are from different times. If you are a sucker for a good romance like I am then you will love this film.